For the final meal of our may term course, Eating Siouxland, we ate at Minerva’s. Minerva’s shares a parking lot with the Hy-veen on Hamilton Blvd. There is another Minerva’s in Okoboji which is near my hometown, so I have experienced the deliciousness that it has to offer. It is definitely a bit more upscale, like Bev’s, if not more upscale of a restaurant. When you walk up the steps to the front entrance you even get the feeling that it is a classy place. The lighting is dim inside to create a relaxing atmosphere for the guests and soft music played in the background to add to the effect. We came together and ate as the whole class since it was our meal. The hostess seated us at a large table near the back of the restaurant in the middle dining area. We had a beautiful waitress come take of us and got our drinks ordered right away. I forgot my driver’s license, so I was not able to get an alcoholic drink. I opted for the strawberry lemonade and that may have been more enjoyable than an alcoholic drink anyways. It came out in a large glass with sugar coated around the rim of it. It was the perfect mixture of sweet and sour. Next, it was time to order some appetizers. Because it was our last meal, we ate like it was literally our last meal on earth. We ordered almost every appetizer on the menu including quesadillas, coconut shrimp, and onion rings. It didn’t take long for them all to come out and they tasted delicious. The sauces that came out with each item just made them even better and I was full before my main course even came out! I knew I would be full, but I wanted to end the course with a great meal, so I ordered my all-time favorite meal. I got the steak with mashed potatoes, with an Italian house salad. The presentation of the steak and potatoes was superb. 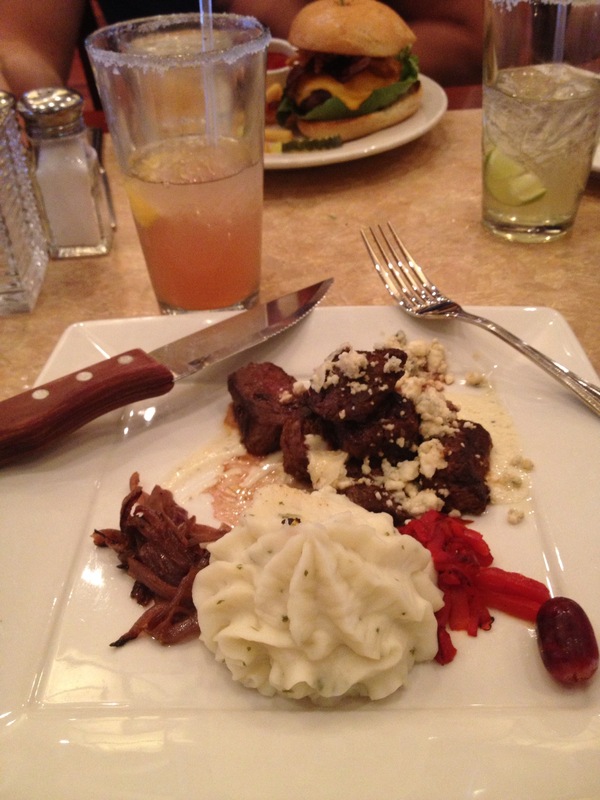 The potatoes looked like a flower from the top view and the feta cheese was sprinkled perfectly over the steak. The chef separated the peppers and onions strategically around the potatoes and placed a grape on the plate as a nice garnish. It was a colorful, yet beautiful plate. I was beyond full by the time my plate got to me, but it would be such a waste of steak to not eat it immediately. I manned up and began eating. Before you know it, I had eaten everything off my plate. I could have easily tossed in the napkin and gotten out of the restaurant, but I had to have one last dessert and the tin roof sundae sounded like it would be the best thing for me. 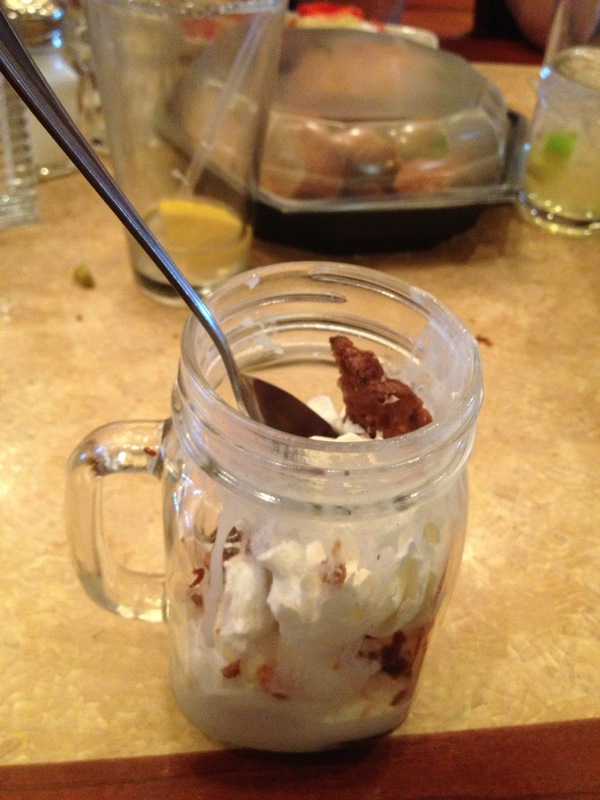 The ice cream came out in a mason jar with peanuts, chocolate, caramel and whipped cream covering it. To top it all off, two slices of sugar-coated bacon were stuck in the top of it. I died and went to heaven. Although I was stuffed, this sundae hit the spot and ended the course better than ever. I couldn’t imagine this course ending better than it did. The atmosphere, service, and food at Minerva’s was top notch. The waitresses was kind, helpful, and funny, while also doing an excellent job keeping our large group pleased. The food was absolutely amazing and left me uncomfortably full, but I was fine with it. The prices at Minerva’s are way too high for my college budget, but if you are looking for a fancy place to go with great service and food, Minerva’s is definitely the best restaurant to go to in Sioux City.